Residents near Brooklyn Transfer on Thames Street are asking a judge to help clean the facility up. EAST WILLIAMSBURG — Neighbors of a maligned garbage weigh station are suing the owners asking a judge to step in and clean up the mess. Ten residents who live near Brooklyn Transfer at 113-115 Thames Street in East Williamsburg say they're sick and tired of sleepless nights caused by truck noise and foul odors that permeate their apartments and spoil their appetites. The neighbors, a mix of recent transplants and long-term residents, are requesting a judge step in to demand that Brooklyn Transfer, owned by Nino and Anthony Tristani who run the private commercial garbage hauling company Five Star Carting, follow all city laws and regulations and provide an unspecified amount in damages for the pain they've suffered. Teghvir Sethi, 26, who moved into his apartment three years ago, not knowing about Brooklyn Transfer because the broker showed him the apartment on a Sunday when the facility is closed, said he uses two white noise machines, an industrial fan and an air purifier each night, to block out the sound of truck traffic coming from Brooklyn Transfer. But even with all his equipment running, he still wakes up during the night several times a week, he said. "Especially in the middle of the night from 1 a.m. to 7 a.m.," he said. "That's when they start." And twice he's suffered asthma attacks when passing the facility and breathing in the chemical spray used to mask the garbage odor, the lawsuit claims. He now takes a longer route to avoid the entrance completely, he said. Zalmen Labin, the owner of Loom Yoga which opened across from Brooklyn Transfer in 2010, has also joined on the lawsuit, saying he's lost clients and can't hold onto instructors because of the smell and odors. Two neighbors parked cars have been side-swiped by garbage trucks, the lawsuit claims. Magda Escobar-Beltran, 41, who's lived nearby on Grattan Street since 2005, said she can't use her backyard after nightfall because the rats take over, lured to the area from the garbage dump nearby, according to the lawsuit. She spent a sleepless night chasing a rat around her house after leaving the back door open for a few minutes, the lawsuit alleges. 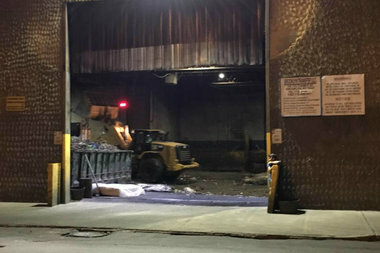 The residents argue that while Brooklyn Transfer is making their lives miserable, the facility continues to operate with disregard to city laws and regulations breaking rules about allowing trucks to queue and idle, leaving waste on public streets, leaving their doors open letting trash odors waft around the neighborhood and exceeding noise limitations. The tensions with Brooklyn Transfer echo increasing friction in gentrifying industrial areas like East Williamsburg, where an influx of residential tenants are raising alarm bells about quality of life issues stemming from the industrial businesses that were there first in many cases. Similar concerns arose this spring at a flour factory nearby on Bushwick Place. They began their campaign against Brooklyn Transfer in 2015, with a barrage of 311 complaints that had little impact, the lawsuit states. They ramped up their efforts in 2016, publishing a report they claimed documented 1,200 violations in a six-day period using extensive video evidence from security cameras around the area. But even the video evidence did little to change behavior at the site, forcing them to resort to a lawsuit. This February, neighbors met with management of Brooklyn Transfer who agreed to make about a dozen simple fixes that would improve the lives of their neighbors. But six months have past and they've only implemented the easiest fix, a sign warning pedestrians to watch out for trucks, Sethi said. "Anything that involved real change, outside of a sign that says watch out, they didn't do," Sethi said. "We've tried pretty much every route that you can do." Lupe Todd-Medina, a spokeswoman for an industry group that represents trade waste haulers, declined to comment when she couldn't reach the Tristani's. Brooklyn Transfer also didn't return a request for comment.